Who knew that once we left the Caribbean that we’d still be able to find blissfully peaceful and secluded anchorages. 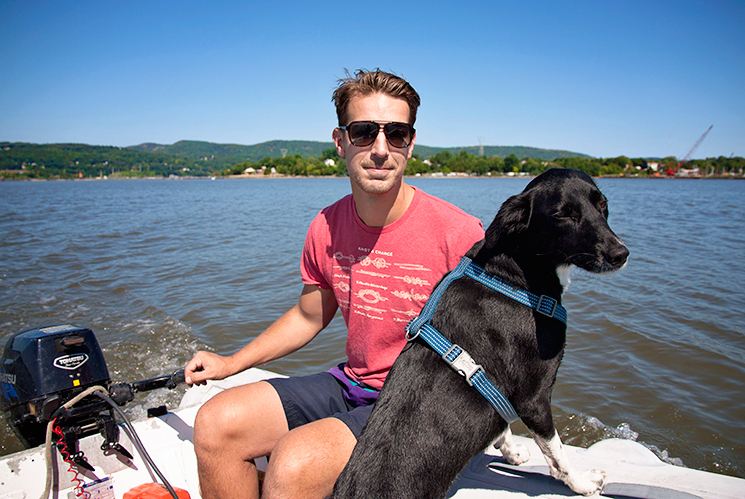 Jason and I took a 4 day weekend and motor-sailed ourselves up the Hudson River for Labor Day. Living in one of the busiest and most populated cities in the world, I sometimes forget that you don’t have to go far to escape the city life and see some pretty amazing things. 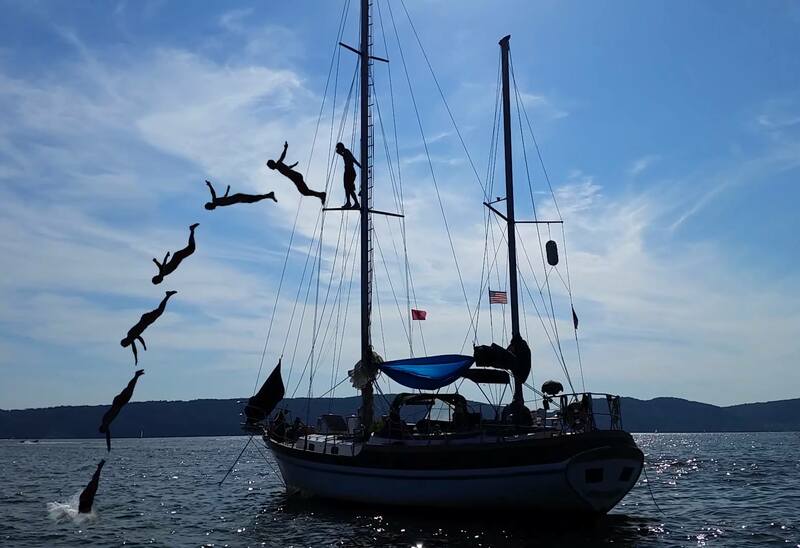 New York State is an outdoor enthusiast’s dream – mountains, rivers, lakes, open oceans, bays and beaches – you can get a little bit of everything here. 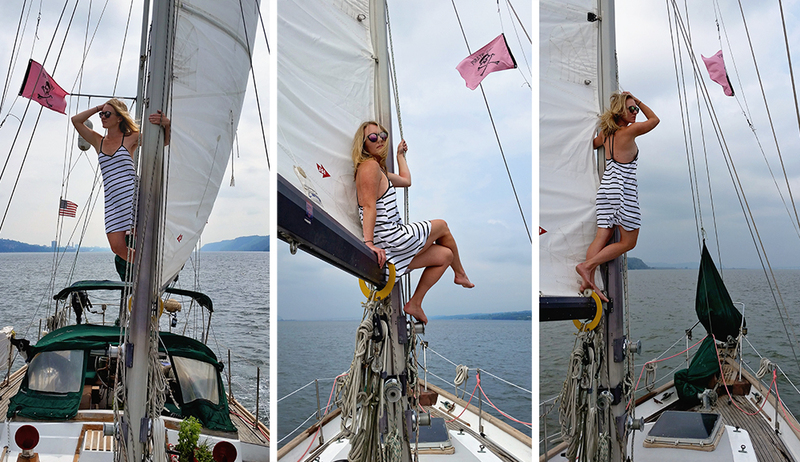 I needed a new facebook profile picture, and we were a little bored out there all alone, so we staged a photoshoot on the mainsail. There isn’t anything much more spectacular than a sunset at anchor. It was really neat to sail by the remains of Bannerman’s Castle. 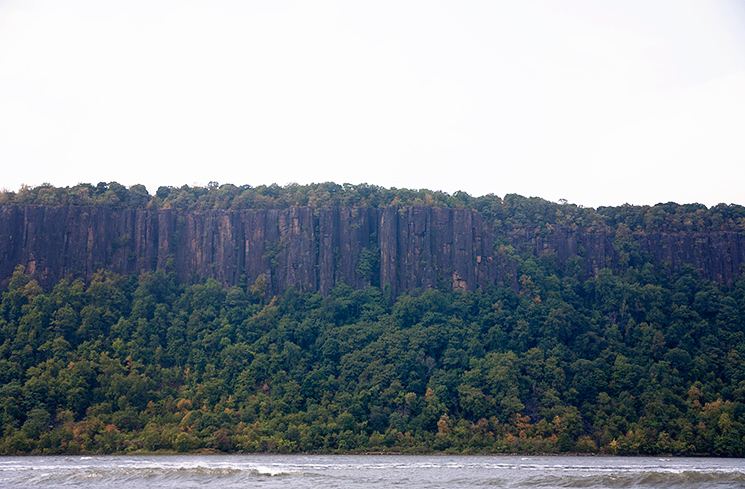 There are daily tours that leave from nearby Newburgh. When we left on Friday we were literally one of maybe 5 boats out on the water (once we got past the city, of course). We both didn’t really know what to expect but it turns out that sailing the Hudson River is so much better than the ICW. The river is wide, deep and the best part is that there are no unmarked crab traps anywhere! The scenery really can’t be beat either. Instead of sandbars and bushes, you get mountains and cliffs. It’s breathtaking. 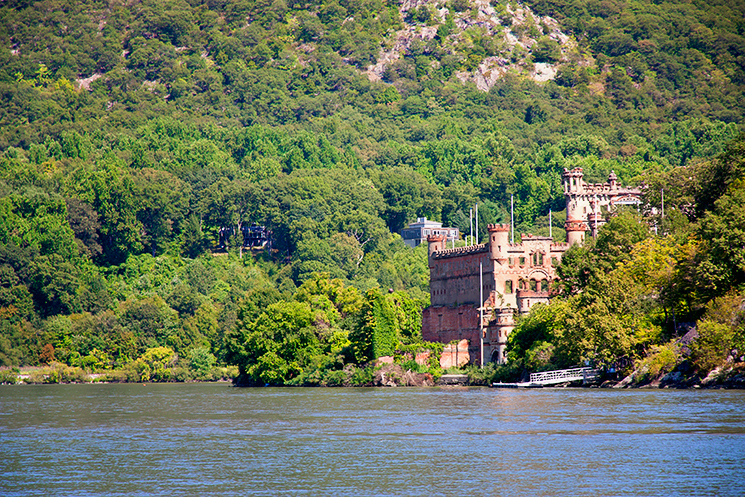 We cruised past West Point and the remains Bannerman’s Castle which were both really cool. We are already planning a trip up here this Fall to check out all the foliage. One downside to the Hudson River is the lack of a lot of really good anchorages for deep draft boats. There are definitely a few, but most of the anchorages have such a narrow area that is suitable for overnight. There were a few spots we wanted to anchor that we just wouldn’t be able to let out enough scope to get the anchor set to feel comfortable. 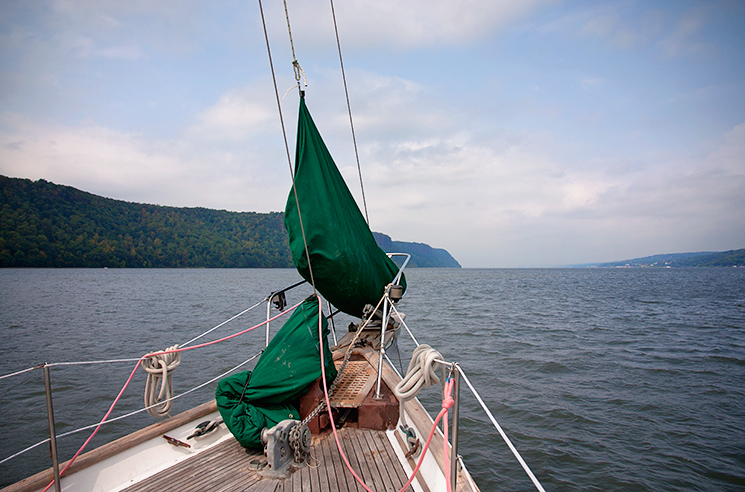 Two good spots we found were Haverstraw Bay and Greens Cove. 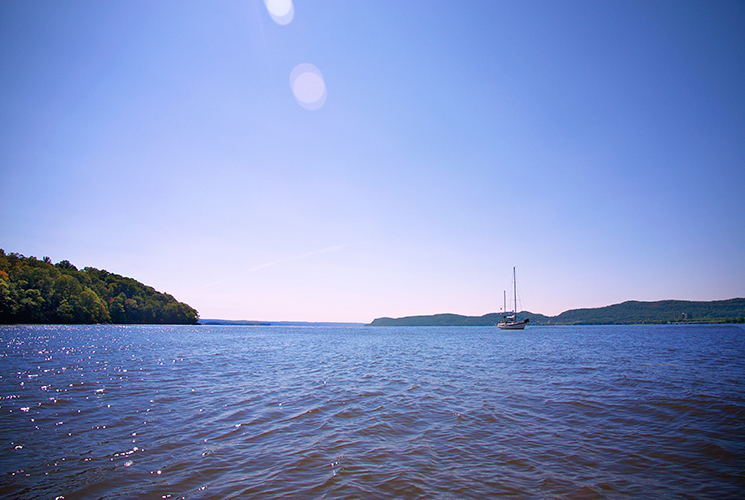 Haverstraw Bay is quite large so you can tuck in enough to avoid the wake from passing by boats. The Bay is about 8 feet deep pretty close in to shore so you can get really far up. 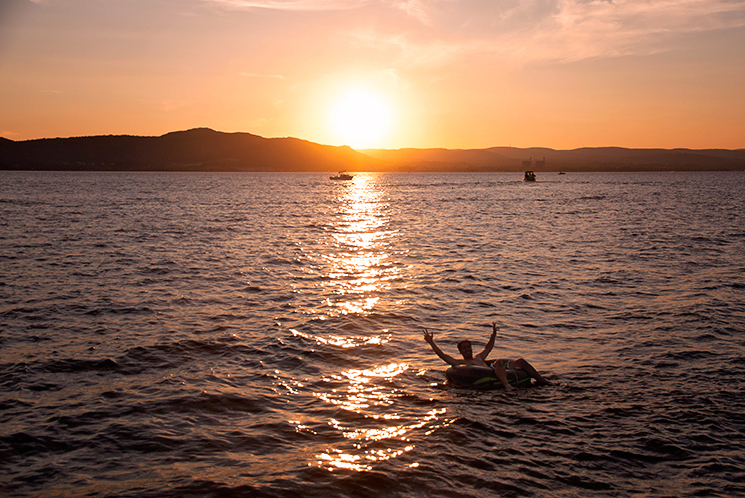 The Bay gets really crowded during the day, but the majority are day-boaters and leave once the sun sets. You aren’t legally allowed to beach your dinghy, so keep that in mind if you have to walk any dogs. We really liked anchoring out in Greens Cove. We were the only ones there, total seclusion. There is a town ramp/dock across the cove that you can tie your dinghy up to. The park at the dock was really cute too. The dogs loved it! Downside to this spot is you’re not really protected from the wake which picks up in the morning. Riley getting ready to leap out of the dinghy and swim to shore. He loves to swim! Jumping off the spreaders is fun. Just don’t jump from the outside edge and hypothetically crack it. One really fun thing about cruising up the Hudson River is all the dock and dine restaurants you can stop at along the way. While a lot of the docks are designed for smaller powerboats, there are a few that can accommodate bigger sailboats. If you want to visit for yourself, be sure to call ahead to make sure they can handle your boat. We stopped at Hudson Water Club in West Haverstraw and picked a spot outside so we could keep an eye on the pups on deck as we dined on some pizza and beer. The view of the Hudson River truly is remarkable. A little further up the river in the town of Newburgh you can tie up on their dock for $20 and then there are probably 10 or so riverside restaurants that you can dine on. This was the perfect peaceful escape and we can’t wait to head back up in a few weeks to see all the fun colors. Next go around we’ll be sure to pencil in some hikes on the riverside Storm King Mountain and Bear Mountain. Guys, you can tie up your dinghy at the base of the mountains! Can it get any better than that? I think we saw you at the fuel dock at Liberty Landing Sep 4/5 as we came in on s/v Little Wing, our Valiant 42CE. Enjoy your blog – keep exploring! Are you still at liberty landing? Would love to meet you if you are! I wish – we had to move on, down to Sandy Hook (like your trip) and down the NJ Coast around Cape May, up the Delaware Bay, thru the C&D, and now in The Solomons in The Chesapeake. But we’ll see you “out there” hopefully! Wow, I would have never thought there was such great cruising grounds so close by! Looks like a wonderful weekend. Sounds SOO nice. Who did that crazy jump off the boat?? Great Shot! What a nice trip. Who did that crazy jump off the boat?? Great Shot!